MEYER SPRINGS PHOTO GALLERY. The canyons of the Devils, Pecos and Rio Grande rivers are full of alcoves. Many of these alcoves have ancient Lower Pecos Style pictographs in them. 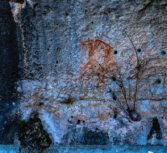 Meyer Springs Pictograph Site, on private land, features both ancient and historical images. 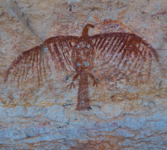 For more information about Rock Art in this area, click HERE. Click on the first thumbnail to see larger image. Use controls at bottom of each large image to start slide show or go through manually with arrow keys.